So what does an inverter do? Simply put, it converters DC power to AC power. Solar panels produce DC and batteries store DC, however our appliances run on AC, as does the power grid. That is why all solar systems and battery storage systems need an inverter. In a grid-parallel installation, the size of the inverter/charger can be (much?) smaller than the highest expected nominal and peak loads. For example, to cover the base load of a two-person household, an 800VA inverter/charger may be sufficient. For a family, a 3000VA inverter/charger can run most appliances – as long as not more than one of them is running at the same time. This means that the system can reduce grid power consumption from late spring to early autumn – perhaps to zero – with sufficient storage. 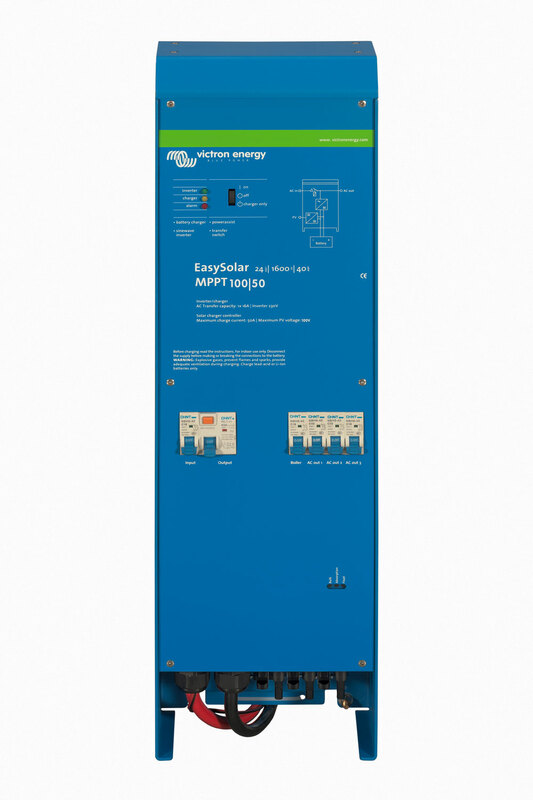 High surge power rating – The surge power rating of the Victron inverters is very good being roughly 2.5 times the rated continuous power output. 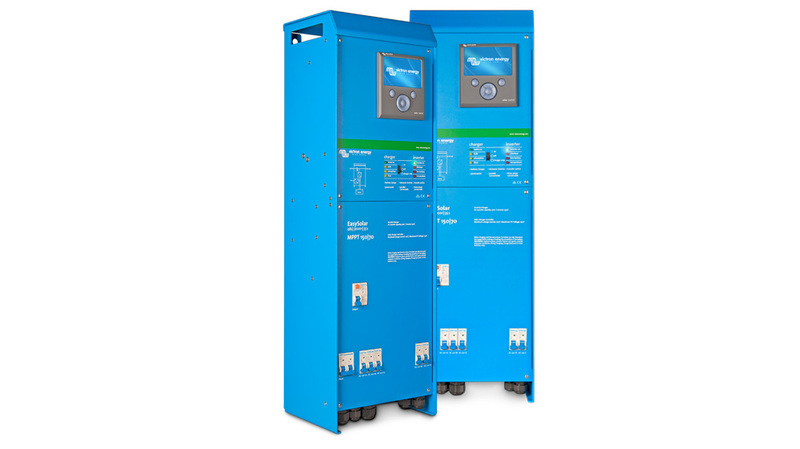 This equates to a 2400W (2.4kW) continuous output inverter providing peak output of 6000W. This is enough for the short start-up spikes from pumps, compressors, etc. The EasySolar combines a MPPT Solar Charge Controller, an inverter/charger and AC distribution in one enclosure. The product is easy to install, with a minimum of wiring. All-in-one solar power solution The EasySolar combines a MPPT solar charge controller, an inverter/charger and AC distribution in one enclosure. The product is easy to install, with a minimum of wiring. Color Control panel Two outstanding functions: – Prioritizes battery charging by the MPPT charge controller – Connects to the internet, enabling remote monitoring (VRM website) and remote control. MultiPlus Compact-functional The MultiPlus Compact gets its name from the multiple functions it can perform. It is a powerful true sine wave inverter, a sophisticated battery charger that features adaptive charge technology and a high-speed AC transfer switch in a single compact enclosure. Beside these primary functions, however, the MultiPlus Compact has several advanced features that provide a range of new applications as outlined below. 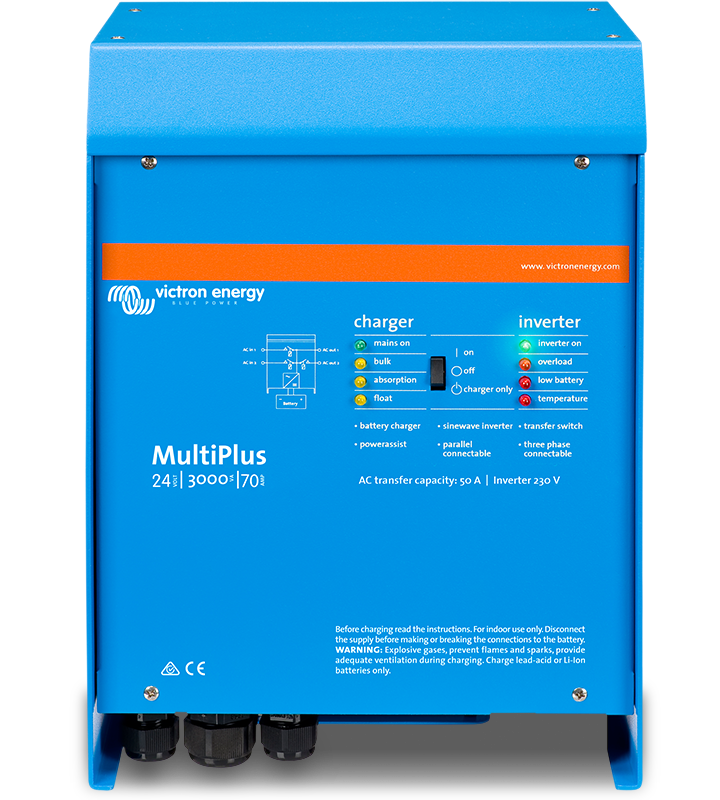 Uninterrupted AC power In the event of a grid failure, or shore or generator power being disconnected, the inverter within the MultiPlus Compact is automatically activated and takes over supply to the connected loads. This happens so fast (less than 20 milliseconds) that computers and other electronic equipment will continue to operate without disruption. PowerControl – Dealing with limited generator or shore side power With a Multi Control Panel a maximum generator or shore current can be set. The MultiPlus Compact features a microprocessor controlled ‘adaptive’ battery management system that can be preset to suit different typs of batteries. The ‘adaptive’ feature will automatically optimize the process relative to the way the battery is being used. The right amount of charge: variable absorption time When only shallow discharges occur (a yacht connected to shore power for example) the absorption time is kept short in order to prevent overcharging of the battery. After a deep discharge the absorption time is automatically increased to make sure that the battery is completely recharged.